Holy crow, it's practically summer. 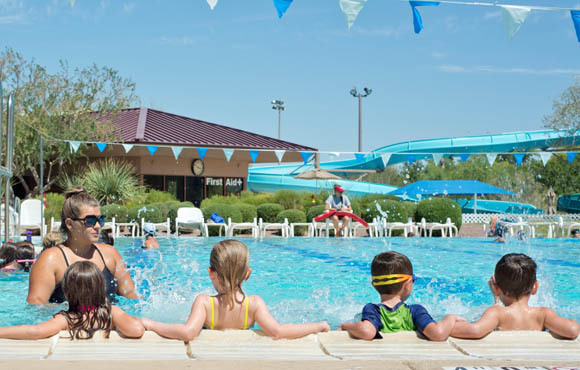 And when you have kids that love the water as much as mine, that means finding a pool and figuring out fun things to do in it. 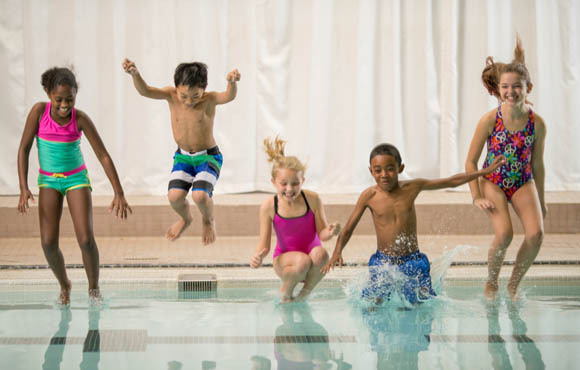 Sometimes all kids need to be entertained is the pool itself, but every kid loves a good pool game. If you're tired of playing, "Mommy, try to get away while I chase you," (which really means, "Mommy, do your best to haul yourself around this pool without getting any of this community bath water in your mouth, while I kick strangers in the stomach, splash old ladies in the face and run into babies who are in the pool for the first time.") then these alternatives should float your boat. 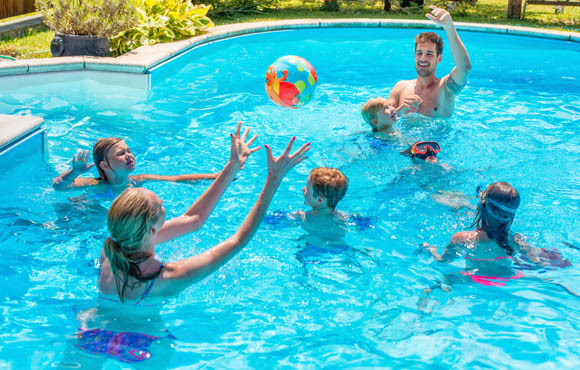 Using large beach balls (or any kind of balls), see who can push theirs to the other side of the pool first. And yes, throwing the ball is cheating. Come on, kid. 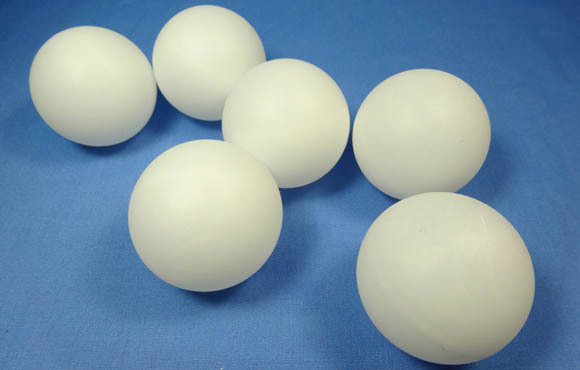 Buy a bag of ping-pong balls (pro tip: you can sometimes find them in the beer section of your local grocery store. If your kids ask why, tell them beer is the favorite beverage of professional ping-pong players, which may in fact be true.) Then, just toss them in the pool. 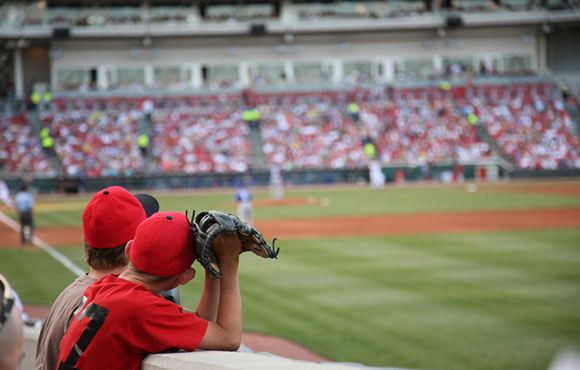 Your kids will love racing around trying to capture them all. 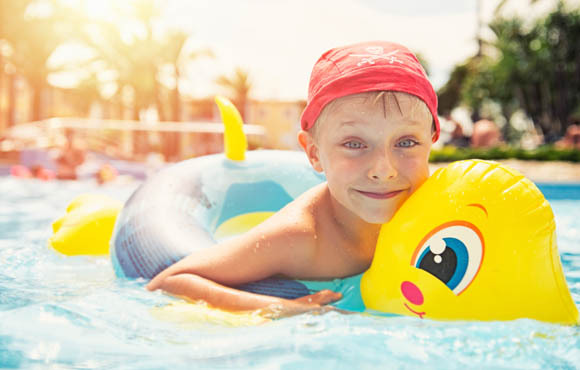 Marco Polo is always a safe bet at the pool, but why not step it up a notch and have the kids make animal noises? It's a lot more fun to watch one kid yelling, "DOLPHIN," and the rest answering back with their best ear-splitting porpoise impressions. Another popular pool game that involves speed and fear—two of my favorite things to experience at the pool. One child is the shark and stands in the middle of the pool. The rest of the kids are the minnows. When the shark says, "Go," the minnows jump in the pool and try to get past the shark without getting tagged. The kids who get tagged are out until you eventually have a one-on-one shark versus minnow match that is sure to elicit giggles, screams and maybe some pee. But that's why God created chlorine, right? Best with older children who can hold another child's body weight on their shoulders, the classic chicken fight is fun because it allows kids to do something that parents wouldn't want them to do on dry land—namely, shove someone down. Falling is fun when you're in the pool. Falling is not fun when you're on concrete. Life Lessons, love Mom. My kids learned this one when they first started taking swim lessons and loved it. One person is Mr. Fox and stands at one end of the pool. The other kids stand at the other end and yell together, "What time is it, Mr. Fox?" Mr. Fox picks a time, and the other kids need to move forward that number of steps (e.g. 5:00 means five steps, etc.). At any point, Mr. Fox can decide that it's "Lunchtime," at which point everyone starts screaming while the fox tries to tag one of the kids who are trying to get back to where they started. Whoever gets tagged is the new Mr. Fox. I promise you, little kids love this. I like to call this game, "Earn Your Allowance." 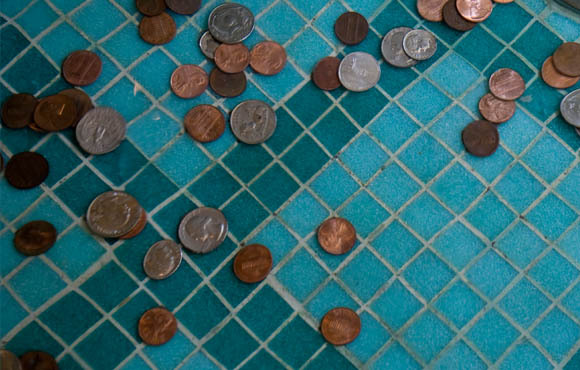 In it, the adult tosses a bunch of change into the pool and kids pick up the coins from the bottom—like diving for treasure. This is probably not a great choice for the family swim hour at your local community pool. Like the Beach Ball Race earlier, this one involves any pool toy you can get your hands on—tubes, loungers, pool noodles, big inflatable dolphins, the more ridiculous the better. The fun is seeing who can get across the pool with their ridiculous toy first. 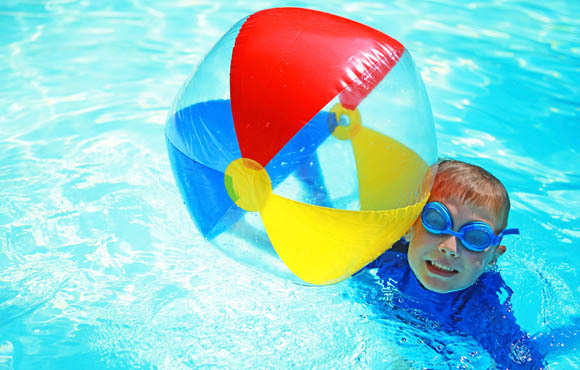 The goal of Air Ball is to keep a beach ball in the air and not let it touch the water. Kids love to play this game with balloons at their friends' birthday parties, specifically inside their friends' living rooms where there tend to be inexplicably large amounts of fragile items. It's a lot less expensive in the pool. I remember playing this game as a kid and loving it. One person is the Quizmaster, and the rest of the kids line up at the deep end. One by one, the kids will take a few steps and then jump into the pool. While they are moving but before they jump, the Quizmaster will ask a simple question, such as, "What color is the sky," "What is your dog's name," or "What's the name of the first president?" The jumper needs to answer the question while in the air but before they hit the water. When people start to miss easy questions, or as the questions get harder and more absurd, the game becomes increasingly fun.